Riders at a CicLAvia event in 2013. 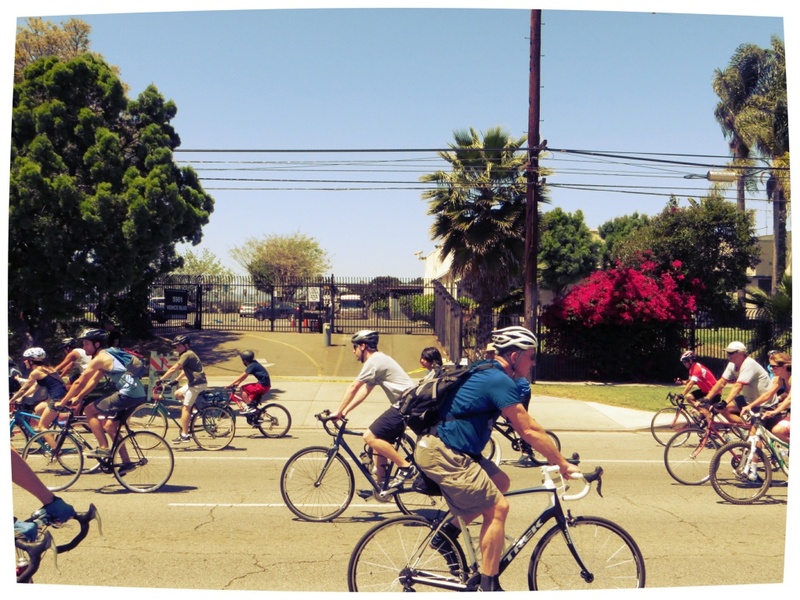 SoCal's favorite car-free event returns to the San Fernando Valley on Sunday. 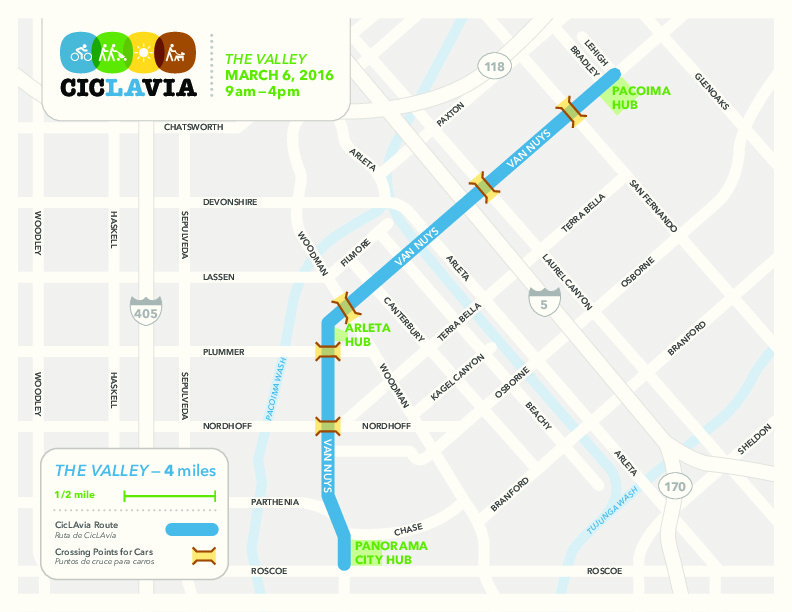 CicLAvia first hit the area last year with a 6-mile route along Ventura and Lankershim boulevards. This time, the route will stretch along a 4-mile section of Van Nuys Boulevard that runs through Pacoima, Arleta, North Hills East and Panorama City. There's a chance of rain on Sunday, but the folks at CicLAvia say the event should happen whether it rains or shines. Any changes will be announced on their website. You can join the ride anywhere along the route between 9 a.m and 4 p.m. If you want to join L.A. Mayor Eric Garcetti and "Machete" star and taco entrepreneur Danny Trejo for the kickoff ceremony, be at Pacoima City Hall at 8:30 a.m. The event will shut down Van Nuys Boulevard to all cars between Roscoe Boulevard and Lehigh Avenue from about 8 a.m. to 5:30 p.m. Drivers traveling along surrounding streets should expect delays. You could also take the Metrolink from the Sylmar/San Fernando Station to the Pacoima Hub. Here's CicLAvia's list of available bike shops. Pro tip: Don't procrastinate. If you want to rent a bicycle, make reservations early before they sell out. Intrigued by solar energy? The company Pick My Solar plays a matchmaker of sorts. First, solar designers draft a system for your home. Then, they'll crunch the numbers on how much you'll save. After determining the chemistry between your home and the sun, they'll hook you up with compatible local solar companies. Learn the art of the underdog sport of the Olympics. Hollywood Curling is an organization that promotes curling in Los Angeles. For the second year in a row, its members will teach newbies how to play and answer all your questions about the game. Learning how to ride a bike is a childhood milestone. To make sure the young ones do it safely, First5LA is sponsoring a kids' bike safety skills course. Get there early to pick a free kids' bike helmet while supplies last. You may have already seen artist Levi Ponce's work all over Van Nuys Boulevard. To see him in action, watch Ponce work on his latest addition to the "Mural Mile: Dream Without Boundaries." Click here for more CicLAvia details.